Since its advent in the early twenty-first century, uniportal VATS has expanded its utility from simple procedures (such as thoracic sympathectomy, pleural deloculations, mediastinal biopsies, pneumothorax, and wedge resections) [1–4] to major lung resections [5, 6]. 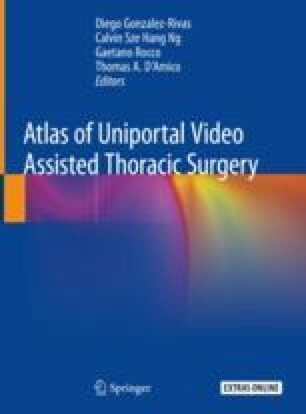 For over a decade, this technique has become in vogue as surgeons gradually overcome the technical challenges, and perceived its potential benefits for patients in terms of reduced access trauma and postoperative discomfort, reduced chest wall pain and paresthesia, and quicker recovery . Ng CS, Yu SC, Lau RW, Yim AP. Hybrid DynaCT-guided electromagnetic navigational bronchoscopic biopsy†. Eur J Cardiothorac Surg. 2016;49(Suppl 1):i87–8. https://doi.org/10.1093/ejcts/ezv405.